The most aggressive black brush guard available for your H2. RealWheels provides a more appropriate look for the H2 by using significantly larger diameter stainless tubing to produce these impressive guards, with a custom wrap-around styling and horizontal light-protecting inserts. Only RealWheels offers Hummer enthusiasts a LIFETIME Limited warranty, and the confidence of large diameter stainless steel construction. All guards will eventually encounter flying road debris, salt, bugs, off-road brush or other obstacles. Don’t settle for chrome or paint over regular steel that can rust once even the smallest surface chips occur. Maximum protection, unmatched styling! All RealWheels guards are genuine, American-made quality. 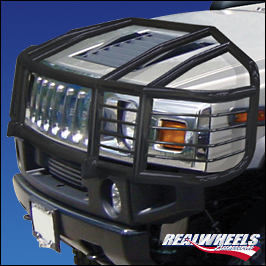 Includes grooved black powder coated hood handles.